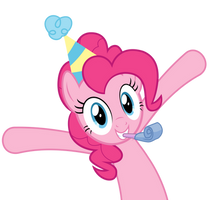 You haven't been to a party if its not a Pinkie Pie party! I haven't done a Pinkie Pie vector in a while. *EDIT*: Added Ai file converted SVG file w/ a few small tweaks for accuracy. I also made one of Rainbow Dash. What do u think? Do u want me to post the rest of the mane 6 (Except Pinkie)? "...my FAVORITE time of the day!!" I was looking for a Pinkie Pie vector to use for a PMV. Every time I'm browsing other vectors, I'm somehow coming back here. I wanted to avoid using popular poses, but I guess this has to be an exception. may i use it for..........Plz icon ? may i use to make a base? i credit you! Hi. I made this into a base. I will credit you and send you the link later. Wow. Cupcakes got me into the dark and creepy Pinkie Pie, but for some reason I thought of looking up Madonna's "Where's the Party?" on youtube and have been playing it pretty much nonstop the past two nights. I was thinking about drawing a cheerful happy Pinkie Pie to post here, but you got there ahead of me! Awesome energy you gave her here! May I use this vector in an image I have planned, if I give you credit? Used this to do a little bitta pixel art! Hope you like! Thanks for awesome vector! I used it here - [link]! Used, thank you so much!